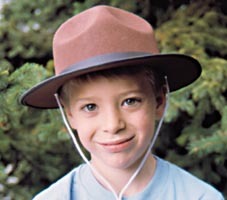 For the pretend world of little rangers, this brown felt ranger hat is sure to be a hit. M-268 fits children up to age 8 or 9. Choose M-269 for older children. Includes an adjustable chin strap. Made in the USA.